The interstate overpass above East 10th Street in Idianapolis, IN historically has served as a barrier separating the Cottage Home neighborhood from downtown and nearby Massachusetts Avenue. The connection of the Monon and Cultural trails has provided a link that makes the corridor a little more pedestrian-friendly and ushered in a wave of new-home construction. A local developer, Ursala David, plans to build 14 modular homes in the up-and-coming neighborhood as part of a project that could include a two-story mixed-use development along East 10th Street. 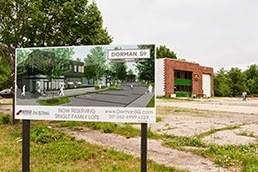 The two-story, 1,600-square-foot residences starting in the high $200,000s would be built along Dorman and Stillwell streets south of East 10th Street. Homebuilder Ursula David has built two custom modular homes—one for herself—and has a third one sold as part of a small, architecturally designed pre-fabricated development she launched last year. Gentrification of a neighborhood or addressing a housing need in the area - $200,000 starting price - hmmmm? Worth a visit to her website and explore the Indy-Mod marketing concept - Ms David has effectively targeted her niche buyer. Kudos! !